In part I of CBSE Class 12 Chemistry: Chapter Notes on Solutions, we have covered basic concepts. In part II we will study the following topics: Vapour Pressure of a Liquid Solution, Vapour Pressure of a Liquid-Liquid Solution, Vapour Pressure of a Solid-Liquid Solution, Ideal and Non-Ideal Solutions, Positive & Negative Deviation from Raoult’s law Azeotropes, Minimum boiling azeotropes, Maximum boiling azeotropes. In part I of CBSE Class 12 Chemistry: Chapter Notes on Solutions, we have covered basic concepts like definition of solution, types of solutions, various ways to express concentration of solution, solubility, solubility of solid in a liquid and some conceptual questions. The notes given below on above mentioned topics are important for CBSE board exams as well as competitive exams. p1 = Vapour pressure of component 1 in solution. x1 = Mole fraction of component 1 in solution. The equation ...(6) is known as the mathematical expression for Roult’s Law for the solution made up of two volatile liquids. • ptotal can be related to mole fraction of any of the one component. 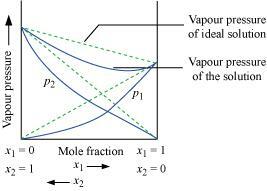 Equation ...(7) gives you the value of partial vapour pressure of each component in vapour phase. When a non-volatile solid is added to the solvent to form a solution, then the vapour pressure of solution is found lower than vapour pressure of the pure solvent at same temperature. The decrease in the vapour pressure of the solution is solely depends on the quantity of non-volatile solute present in solution. The vapour pressure of such solution is given by using general equation of Roult’s Law. Example : solution of n-hexane and n-heptane, solution of bromoethane or chloroethane. It can be summarised as: If a Solution formed by mixing the two components A and B, in which intermolecular force of attraction between A and B (A‒B) is nearly equal to intermolecular force of attraction between pure components (A‒A and B‒B) then no heat would be evolved or absorbed in forming the solution. Also volume of the solution will be equal to the total volume of the individual component taken to form the solution. It can be summarised as: If a Solution formed by mixing the two components A and B , in which intermolecular force of attraction between A and B (A‒B) is not equal to intermolecular force of attraction between pure components (A‒A and B‒B). This new interaction (A‒B) is either less than or more than the interaction of the pure components (A‒A and B‒B). This leads to the positive or negative deviations from Roult’s Law. These are mixture of two liquids having same composition in liquid as well as vapour phase and boil at the constant temperature. This liquid mixture cannot be separated into pure component even on fractional distillation. The solution which show large positive deviation from Raoult’s Law. Example: solution of 95% ethanol in water. The solution which show large negative deviation from Raoult’s Law. Example: solution of 68% nitric acid and 32% water by mass. Solution 1: A mixture of ethanol and acetone shows positive deviation from Raoult's Law. The new intermolecular interaction formed by mixing the component ethanol and acetone is weaker than the intermolecular interactions of pure component pure ethanol. Pure ethanol possesses hydrogen bonding. When acetone is mixed, the molecule of acetone takes the space in between the molecules of ethanol which results in breaking of some of the hydrogen bonds. Due to weakening of interactions, the vapour pressure of solution formed by mixing ethanol and acetone is higher than predicted from Roult’s Law. Hence the solution shows positive deviation from Raoult’s law. 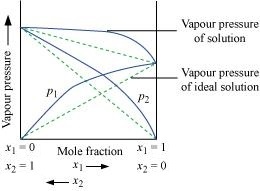 Solution 2: Raoult's law : It states that for the solutions of volatile liquids, the partial vapour pressure of each component of the solution is directly proportional to its mole fraction present in solution. Both laws state that the partial pressure of the volatile component is directly proportional to its mole fraction in the solution. In case of Roult’s law it is liquid and in case of Henry’s law it is gas. Solution 3: Azeotropes: These are mixture of two liquids having same composition in liquid as well as vapour phase and boil at the constant temperature. This liquid mixture cannot be separated into pure component even on fractional distillation. Azeotropic solution boils at constant temperature, regardless of difference in boiling points of respective components. Enthalpy of mixing (ΔmixH) of the pure components to form the solution is zero. Volume of mixing (ΔmixV) is also equal to zero. 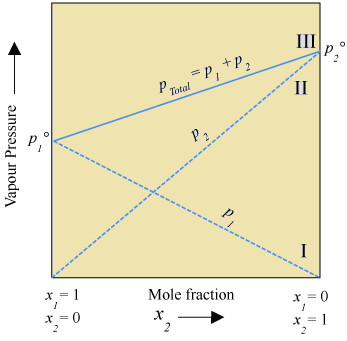 It can be observed that in both the equations, the partial vapour pressure of the volatile component varies directly with its mole fraction. The only difference is the proportionality constants which is KH in Henry’s law and p° in Roult’s Law. Thus Raoult’s law becomes a special case of Henry’s law in which KH is equal to p°. Solution 7: Follow the above theory.